“I’ve been waiting for this since I played here,” said the coach, who is in his third year with the Stingers. He has coached his team to its first nationals berth since 1984—before he was even born. They enter the tournament as the eighth seed after winning the Ontario University Athletics’ bronze medal in a do-or-die battle with the York University Lions. The history behind their long awaited return to nationals isn’t lost on the players. “I know that we’re going to give it our all for more than just ourselves. We have such a strong feeling of pride in this program and in being a Stinger,” said captain Phil Hudon. Related: Lidia Fillion Named RSEQ Rookie of the Year. The Stingers face a difficult matchup in their first game. The top seeded and defending national champion University of New Brunswick Varsity Reds stand in their way of moving past the first round. To complicate matters, UNB hosts this year’s tournament, making it a home game for the already dangerous Varsity Reds. Offensively, few can match what UNB brings to the table. Their 128 goals rank them third in the nation in the goals per game category. The team’s shots per game is the second highest in Canada. They also have 14 players who finished the season in double-digits for points, including three players averaging more than a point per game. Luckily, the Stingers offense packs a punch of its own. Concordia had nine players finish in the double-digits for points and also had three players eclipsing the point per game average. Despite the difference in seeding, the clash of the two top-ten offenses should make for a high-octane battle. It will be a struggle for the two talented defensive units to contain their opposition. The Stingers understand that, coming in as the lowest seeded team, some aren’t giving them much of a chance against teams like UNB. They’re embracing that adversity, gladly. “The best teams are there, it’s going to be a battle. We’re going there to cause a surprise,” said Element. The Stingers coach knows that his team didn’t make it to this point by accident. They were a top-tier team and earned a spot among the country’s best this season. They have bright spots on their roster that could prove game changers against UNB. While the Varsity Reds may have one of the most potent offenses and capable defenses in Canada, their goaltending doesn’t match up to that reputation. 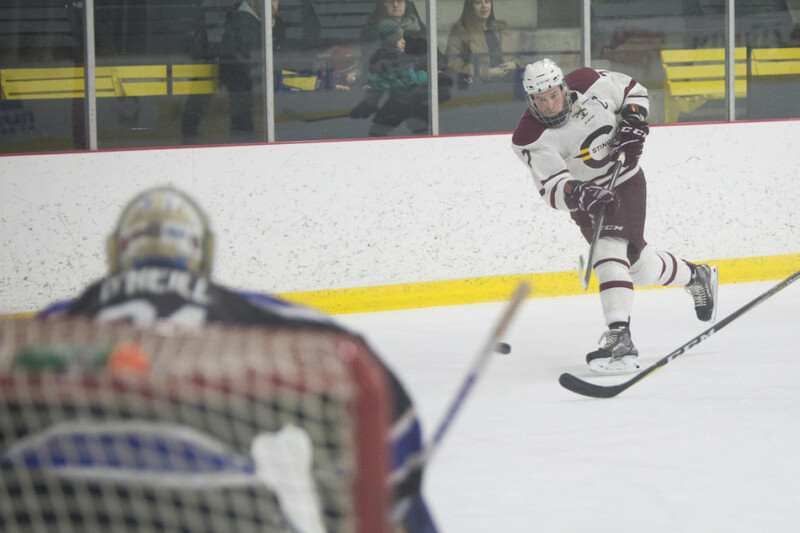 Their starting goaltender Alex Dubeau sits at a .894 save percentage, well below the .915 of Concordia’s Marc-Antoine Turcotte, a player that Element has called one of the team’s best. 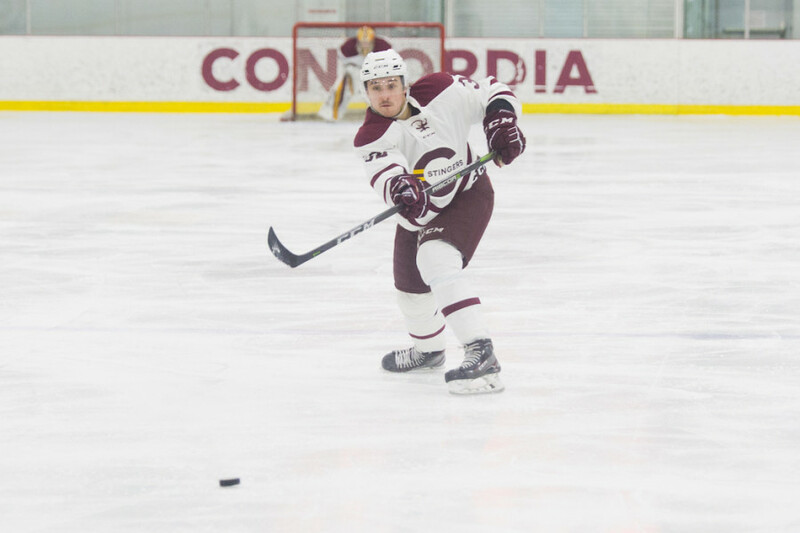 Concordia has been going up against the likes of Queen’s’ Kevin Bailie and McGill’s Louis-Philippe Guindon, all-stars and game changing goalies that can take over a series. Dubeau will be a welcome change for the Stingers. On top of this, while UNB may have a deeper group of skaters, Concordia’s all-star players have outmatched UNB’s this season. OUA East MVP Anthony Beauregard was the country’s top scorer with 60 points and the second best goal-scorer with 19. Rookie defender Carl Neill joined Beauregard on the OUA East all-star team and led all defenders with 31 points in just 28 games. Closing out that group is rookie Massimo Carozza on the all-rookie team with 35 points. Related: Stingers Women’s Hockey Team Set for Nationals. These three will be heavily leaned on in the one game series. UNB will counter with star forward Kris Bennett who had 38 points in 30 games. For now, the Stingers are going to take it one game at a time with a simple goal in mind: Proving the doubters wrong. “We’re going to be turning some heads,” said Hudon. The puck drops at the Aitken University Centre at 7 p.m. The winner of the matchup will qualify for the semi-finals to be played Saturday afternoon.